James Drury was apprenticed in the Clockmakers' Company in December 1687 to Francis Hill and freed in April 1695. The 1687 record states that he was the son of Joseph Drury, but that part has then been crossed out. Was it an error? Or was it correct but crossed out because the father's name was not usually entered in Company apprenticeships at that time? Too much information perhaps? Later investigation shows that his father was in fact a Joseph Drury. Francis Hill was a little-known clockmaker. His work is known today through only a single example of a lantern clock, yet he followed the clock trade for thirty years or more. Presumably he spent much of his life as a journeyman. By the terms of his bond an apprentice was forbidden to marry, which for many young men meant that as soon as they had their freedom from apprenticeship, they were desperate to tie the knot. So when I located a marriage record on the 21st December 1695, just months after his freedom date, of James Drury marrying at Allhallows London Wall to Joanna Forby, there was a good chance that it was the right James Drury, and it later proved to be so. This was the more likely because in 1695 Francis Hill was recorded as working in Half Moon Alley (of which there were actually seven at that time in London! ), being the one located in Cripplegate Without Ward, White Cross Precinct, which was pretty well adjacent to Allhallows parish. It looks as if James Drury was still working as a journeyman for Francis Hill in 1695. In 1697 James signed the Association Oath of allegiance to the King on the list of Clockmakers' Company signatories. All freemen were required to do this, though a few members of extreme conscience, such as Quakers, refused to sign, as they would not to swear oaths. 1. This lantern clock by James Drury is one of his earlier clocks dating from about 1700 or just before. The alarm disc shows it was originally fitted with alarm work, which was removed later. I was unsuccessful in finding the baptism of any issue of James and Joanna Drury. I later found out that they were religious nonconformists, which may have been fine for their consciences, but made life awkward for later researchers like me, as nonconformist records can be notoriously difficult to find, even assuming they ever existed. It was not until 1698 that James took his first apprentice. A tradesman was not allowed to take on an apprentice until he had his own premises, because of course the apprentices 'lived in'' with the master's family. There were always exceptions, especially among the wealthier or more powerful members, some of whose journeymen took their own apprentices although still living in their employer's house, a device whereby one master might employ several journeymen each with two or three apprentices - in other words a small factory. But we can guess from this that by 1698 James Drury had set up in business on his own in his own premises. This was probably in Little Moorfields in the parish of St. Stephen's Coleman Street, not far from the home of his former master, Francis Hill. April 1701 Henry Stanbury, son of Robert Stanbury of Backswell(? ), Warwickshire, miller - freed July 1709. Notice two Warwickshire youths amongst them. This can be a clue, as we often find that masters took on lads from their own home locality, and sure enough it later emerged that James himself came from Warwickshire. His own son, Joseph, born about 1700, was apprenticed in 1714 through the Leathersellers' Company to John Delafield for seven years. Joseph was married in 1722 to Hannah Sutton and died in 1752. He seems not to have been involved in the clock business and appears to have died childless. In 1728 James was made Master of the Clockmakers' Company. In 1731 he is said to have become clerk to the Company. His work is known through watches, longcase clocks and lantern clocks. His work is sometimes signed 'Jam. Drury London', and sometimes 'James Drury, London'. On the 11th September 1732 James made his will. He was described as of the Parish of St. Stephen in Coleman Street, clockmaker. Not that he was ill, for he lived a further eight years or so. He died in 1740, his will being proved in the Prerogative Court of Canterbury on the 18th March 1739/40. Like his nonconformity this was probably just a measure of the meticulous nature of a man, who wanted things mapped out as carefully as possible. This was perhaps a trait that nonconformists learned to acquire as they trod their way carefully through a society that was legally and socially hostile to them. The will is disappointingly uninformative, as he leaves everything to his wife, Joanna, "having beforehand made provision for my children", whom, to the great irritation of researchers such as me, he does not even name! He specified he was to be buried in the burying ground at Bunhill Fields ("commonly called 'Tindall's Ground') at as little cost and charges as may be". Nonconformist James was having nothing to do with a showy funeral, no bequests to buy mourning rings for remembrance. His austerity no doubt arose from his religion, and approached that of the Quakers, who believed in leaving no trace behind at their passing, even to the point of not erecting tombstones, as they saw that as vanity. This situation always reminds me of Edward East's request in his will of 1688: "It is my express wish that my executrix bury me privately in the night time and that she give nothing but Rosemary att my funeral." East was a Roman Catholic and a quiet burial at night might give them the privacy to say their own preferred form of words as well as being out of sight of hostile onlookers, hecklers and worse. 2. 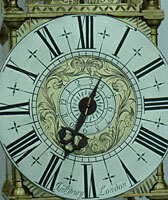 This closeup of the dial centre shows the very fine engraving, which at this period takes the form of entwined foliage. The radiating strokes in the corners and on the alarm disc are unusual and are perhaps a mark of his individuality. The name 'Bunhill Fields' burial ground derives from Bonehill Fields, this being an area of wasteland outside the city where the residual unburned bones of cremated corpses had once been dumped. At the time of the Great Plague in 1665 the London Corporation designated this waste land as a burying place for the surplus corpses as churchyards overflowed, but eventually it was purchased by a Mr. Tindall, and was sometimes called 'Tindall's Burying Ground'. Nonconformists were not permitted burial in consecrated ground. As this land was never consecrated, it soon became a preferred burying place for nonconformists, particularly those from a well-to-do background - there were other nonconformist burial grounds for the poor. James's desire for burial there, confirms his nonconformity and his financial status. Nonconformists steered a delicate course with the law of the land. The state obliged everyone to attend church or face punishment, yet their faiths prevented that. In a world that still believed salvation was the only way to avoid eternally roasting in the fires of hell, their particular belief meant that they were damned if they did attend church and the established church said they were damned if they didn't. We can read between the lines of James's apparently very understated will. At this time most nonconformists did not baptise their children in a church - although they were obliged to marry in one, and normally did so, as James himself had. They might or might not have left a written record of the births of their children in the documents of some chapel. But as far as the law was concerned difficulty could arise if a child had to prove legitimacy (e.g. to inherit), as the only acceptable evidence of that would have been an entry in the register of a parish church, which of course they could not produce. Bequests to a man's children in his will might be contested if the children could not produce evidence of baptism from a church register. So it may have been for that reason that James had already given his children what he wanted the to have, while he was still living. A pound in the hand was worth two in the will! But he took the trouble to mention that he had already provided for them, because the testamentary custom of London required a person to bestow his 'thirds' - one third to his children, one third to his wife, and only the final third as he felt inclined. James mentions that he has already provided for his children, presumably to stipulate that they have already had their third. With a lack of baptismal evidence, I was obliged to piece together James Drury's family tree from the content of wills and apprenticeships. He was born about 1673 in Kenilworth, Warwickshire, the son of a baker named Joseph Drury. His younger brother, Benjamin, was apprenticed in London into the Plumbers' Company in 1692, and we hear no more of him. His older brother, Joseph, had been apprenticed in the Founders' Company in London in 1671 to Richard Meakins and became a founder working in Hackney, where he himself took several apprentices through that Company between 1681 and 1721. Joseph married Deborah Brooks in 1707, by whom he had a single child named Sarah, born in 1709, who was married in 1728 to Thomas Gardiner but died shortly afterwards, leaving Joseph and Deborah childless. Joseph Drury, the founder, died in July 1738, and his brother James Drury, the clockmaker, acted as executor. However Joseph's widow, Deborah, was herself already seriously ill and she died in December of that same year, 1738. She left only a token bequest to her son-in-law, Thomas Gardiner, and everything else went to the children of her brother-in-law, clockmaker James Drury, i.e. Joseph the leatherseller, John, who continued his father's clock business and Sarah, now wife of Samuel Hoole. 3. 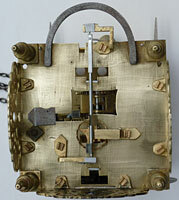 This view of the top plate shows the verge escapement, which is in fact a replacement, as the clock had been converted to anchor escapement at some time in the past. John Drury, son of James, was born about 1699, and was apprenticed to his father in the Clockmakers' Company and freed in 1720. He was a clockmaker and bellfounder and lived in Red Lion Street, in the parish of St. John, Clerkenwell. Presumably the founding business was that passed down from his late uncle Joseph of Hackney and his widow, Deborah. John Drury died in April 1777 a very wealthy man, leaving considerable properties and cash. His son, James, was his main inheritor, together with John's daughters, Margaret wife of John Sturdy, Mary wife of William Trotter, and Joanna wife of Huguenot clockmaker Daniel de St. Leu, whom she had married in 1752 and who died in 1797. His son, James, had been apprenticed to him in 1741 and freed in 1751. It seems young James was a bit of a tearaway in his earlier years, so much so that when his grandmother, Joanna Drury, left James a bequest of £40 in 1748, it was on condition he be of good behaviour: "I give and bequeath unto my son, John Drury, the sum of forty pounds to keep in his hands until his son James shall arrive at the age of twenty one years and then, if he has behaved so well as to deserve it, to give it to him, otherwise to divide it amongst his other children but of his behaviour I appoint his said father to be the sole judge". James's waywardness when an apprentice may explain the odd fact that although he was apprenticed through the Clockmaker's Company to his father, John, he was then 'turned over' (i.e. transferred) to serve a different master, clockmaker Joshua Hassell. Perhaps it was felt that James would be more obedient living under a stranger's roof than working under his own father at home. Presumably James had reformed as John states that in his will of September 1776: "having given to my son all my stock tools and trade for making bells". James continued the clock and bellfounding business till his death in 1811. James's son, James Francis, was apprenticed to his father in 1795 and presumably continued the business after his death, a family of at least four generations in the trade.